Slotastic! Online Casino has just launched the new feature-rich Triton’s Treasure slot machine, a 5-reel 25-line game with both a Major and Minor Jackpot. With bonus games that trigger more bonus games, this undersea adventure is destined to be an instant favourite at the US-friendly online casino. All next week, Slotastic.com players can enjoy an extra $100 deposit bonus just for playing the new slot machine. With all its monthly and weekly bonuses, the site offers a total of $500 in deposit bonuses to new players. 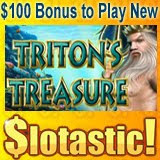 Until the end of February, Slotastic.com is also offering double Comp Points for game play on Triton’s Treasure. In this deluxe new slots game with two jackpots and lots of chances to win free games, Triton, the powerful ruler of the seas, opens up his kingdom so that players can explore unconquered depths and treasures. Three mermaids seduce players with their hypnotic music and grant them the power to get more bonus games or multipliers in the game’s Bonus Feature. The Triton Free Games Feature is triggered when 3 or more scattered Mermaid symbols appear anywhere during normal games. In the five free games that are then played, bonus picks awarded by spinning more Mermaids can be used to either add 5 more free games or to increase the multiplier by 2. Slotastic.com is constantly adding exciting new games. They also offer the largest online progressive jackpots available to American players. The Jackpot Pinatas jackpot, now over $1,600,000, is the largest but there are two other seven-figure jackpots at Slotastic! that are tempting fate with each day that goes by. The Aztec’s Millions jackpot and the jackpot tied to both the Mid-Life Crisis and Shopping Spree slots are all well over $1 million.